For the Sega Game Gear game, see Taz-Mania (Game Gear). 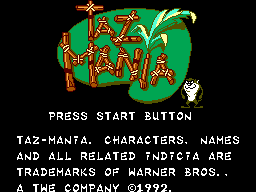 Taz-Mania for the Sega Master System is a platform game released in 1993. It is based on the cartoon series with the same name. Main article: Taz-Mania (Master System)/Magazine articles.